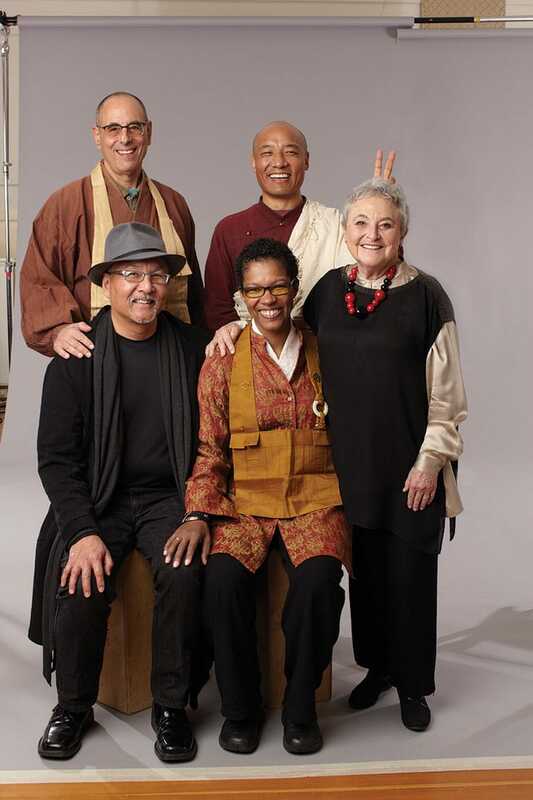 angel Kyodo williams (bottom center), with (clockwise), Larry Yang, Norman Fischer, Anam Thubten, and Sylvia Boorsten, in an outtake from the cover shoot for Lion’s Roar #1. Photo by Christine Alicino. 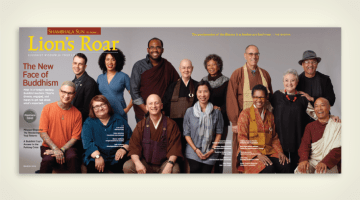 Inside the debut issue of Lion’s Roar magazine (formerly the Shambhala Sun), we asked 14 Buddhist teachers to tell us, “What is the most important teaching to proclaim in today’s troubled world?” Here’s what Rev. angel Kyodo williams, Sensei had to say. 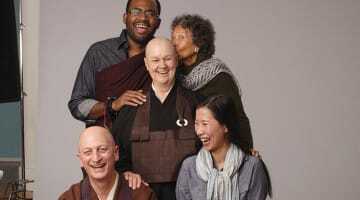 Never before have the teachings of the Buddha found themselves in a society as diverse as ours. 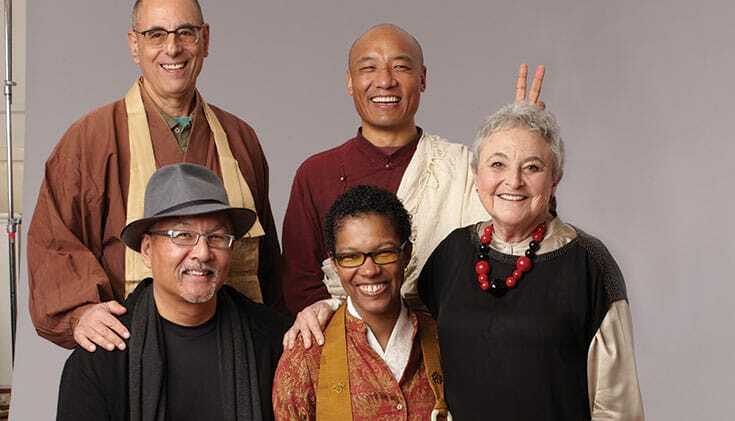 As Buddhist practitioners, we are of different genders, orientations, ethnicities, cultural backgrounds, classes, castes, and creeds. We are even of different religions, and of course, so-called races. Add to this the very real threat to our collective habitat that human activity has generated and we can see that the buddhadharma, like other teachings that offer guidance on how we “be” as a species, is at a crossroads. People and planet need the Great Awakening the dharma beckons us toward. As Buddhists, we can see both the unique challenge and extraordinary opportunity life in the twenty-first century presents us with. While the dharma takes many forms, many Western Buddhists have felt called toward meditation practice. We want to learn what to do to understand how to be. Hence, meditation and mindfulness have formed a central component of our Buddhist curriculum. To that, we’ve added a healthy dose of psychology that appeals to our discursive mind. 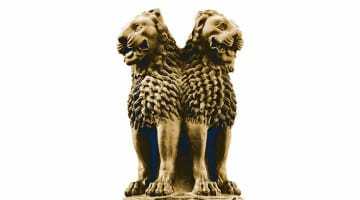 Study of the individual ego, its machinations and wily permutations, is well understood to be a core aspect of our practice–study approach. Indeed, the lens through which we view and interpret the phenomena of life is the determining factor as to whether ours is a “Buddhist” view or not. As individuals, we have taken up this call. But we can no longer afford—if we ever could—to peer only at our individual selves when our collective species is at such great risk. Far from the perpetual loneliness and self preoccupation that our hyper-individualist, consumer culture serves up, the teaching of mutual co-arising—interdependence—is Buddhism’s great gift to the current moment. This teaching of interdependence assures us that we belong. That we are not only of this planet, we are the planet. That we are each other and are thus responsible, in our every action and how we show up in the world, for everyone else. As Buddhists, we must finally summon the courage to turn the lens of this most essential teaching of the Buddha upon the whole of our society and its conditions—not just the parts that we are willing to see. Here’s the thing: If our practice is not attenuating greed, hatred, and ignorance—and its social expressions of overconsumption, supremacy, and oppression—then we need to change our practice. The great inquiry and challenge of our time is: Will we widen the circle of sangha to finally include all beings? I hope so. Our very survival depends on it.